The passenger compartment remained stable in the frontal impact, the windscreen pillar being deformed rearward only 3mm after the test. There was no excessive deformation of the driver's footwell or dangerous tearing of the metal. Dummy results indicated good protection of the knees and femurs for the front seat occupants. Additional tests showed that a similar level of protection would be offered to occupants of different sizes and to those sat in different positions. In the side impact barrier test, the car scored maximum points for the protection it offered the driver. However, in the more severe side pole impact, deformation of the dummy's ribs indicated weak protection of the chest area. The seat and head restraint provided good protection against whiplash injuries in a rear-end impact. 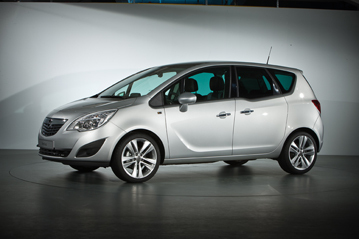 Opel recommend an unusual method of installation for the restraint of the 3 year infant: as well as being fitted using the ISOFIX and top tether anchorages, the adult seatbelt is also used to secure the restraint. Meriva owners should be aware that this is the method of installation used by Euro NCAP in its tests and that the scores and ratings given to the car reflect the performance of the restraint when used in this way. Forward movement of the 3 year dummy in the frontal impact was not excessive. In the side impact, both the 18 month and 3 year dummies were properly contained by the protective shells of their restraints. The passenger airbag can be disabled to allow a rearward facing child restraint to be used in that seating position. However, information provided to the driver about the status of the airbag is not sufficiently clear. A permanently attached label warns clearly of the dangers of using a restraint in that position without first disabling the airbag. The bumper provided good protection to pedestrians' legs in most areas, but was poor in places. The front edge of the bonnet provided poor or marginal levels protection. In most areas where the head of child might strike, the bonnet provided good protection. However, for an adult, the windscreen base and the A-Pillars offered predominantly poor levels of protection. Electronic stability control is fitted as standard equipment. The front seating positions have a seatbeltt reminder as standard. A reminder system is also available as an option for the rear seats; as it is expected to be fitted as standard equipment in the great majority of sales, the system qualified for assessment by Euro NCAP.